Bears are powerfully built. They are covered with long, rough fur, usually of one color, although some have white marks on the chest or face. A bear paw has five digits, each ending in a strong, curved unretractable claw. Bears have an excellent sense of smell, but their eyesight and hearing are not as good. 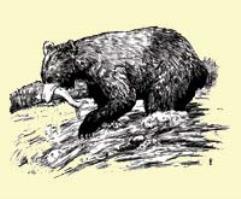 A bear can smell at 100 feet what a human can smell at 10 feet.